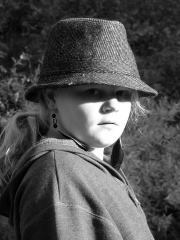 I took this picture of my daughter when we were out walking in the woods one fall afternoon. I loved the way the light was shining on her. She was ahead of me so I got the camera ready and called her name so that I could catch her in an unguarded moment. I wanted a natural looking shot that showed her personality and the peacefulness of the moment. It was good in color but I like the black and white best because it helps you to just focus on her face. Portraits are always a popular form of photography. And it's interesting how, what can seem on the surface to be a simple part of photography, portraits are quite difficult to pull off. A couple of things make portraits 'fail' (for want of a better phrase) - one is eye contact. I realise that there are many portraits where the model is looking wistfully into the distance. These can work, and work well, but as a general rule, a good starting point is to have the model look at the camera. Once you've mastered the eye-contact portrait, then go ahead and experiment with other portraits. Once you've got the hang of it, it's worth trying out different model poses to get a more appealing look. There's more on photography poses here. The other aspect to good portrait photography that can really make a difference is lighting. It's really tempting to use flash with portraits, but be careful! If flash is used to illuminate a dark scene, then it can cast some really ugly shadows. There again, if not used in daylight, the natural light can cast harsh shadows! My advice would be to try using flash in daylight. It can fill in the shadows and give the photo much better lighting. And that would be my only criticism of Sara's photo - harsh shadows. Her daughter's hat casts quite a shadow across her eyes. And, unfortunately, the eyes are what can really make a portrait. By turning on the flash the shadow would be softened, the eyes illuminated (including really nice 'catchlights' in the eyes), and bingo, a top notch portrait! There's much more on daytime flash photography here. I realise that this was one of those spur-of-the-moment portrait photos, and that means Sara couldn't have gone to the lengths of planning that a photographer would usually do to capture a portrait, but maybe worth a mention anyway. Thanks for the submission Sara, I think you should be pleased with the result!